If you have known me for any length of time, you know that I’ve been in the .NET community for over 15 years. I have been in software development even longer, over 2 decades. I’ve seen many technologies and paradigms reborn (think of task runners… Make => Shell Scripts => Ant => NAnt => MSBuild => npm => Grunt => Gulp). Rarely, do us long-toothed developers see anything truly new. Visual Studio has always been the most mature IDE in the Windows ecosystem. Let’s be honest… I love Visual Studio. Parts of Microsoft development stack have their legacy warts. Even so, when people always ask me why I develop using C# and Microsoft technologies even though I have a long Unix background. I answer, because “Visual Studio is amazing”. It truly is the standard by which all other IDEs are measured. 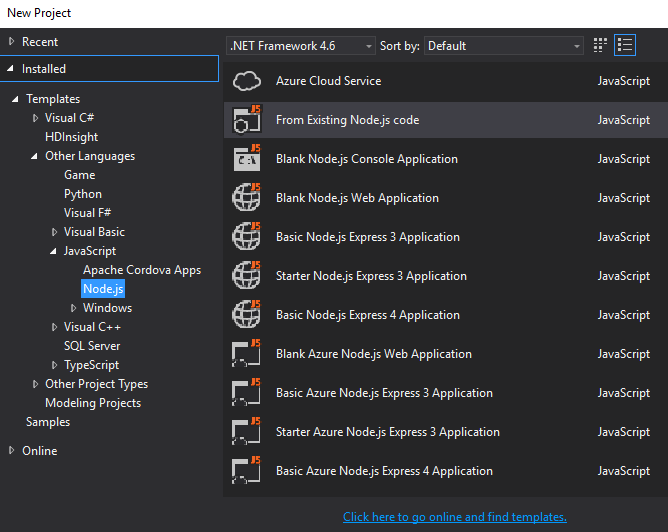 Over the last year, Microsoft has put serious effort in to Visual Studio support Node. Let’s take a look at the Node support. Please remember, this post targets C# developers who are learning Node.js who are comfortable in Visual Studio. Alternatively, you could be a Node developer who is struggling with existing IDEs. In either case. I hope you find the following tutorials helpful. For this example, we’ll be using Visual Studio 2015 Community Edition. For the uninitiated, installing Visual Studio is a big process. Prepare at least an hour of time! It’s a huge tool but very worth it. This is the boilerplate project we’ll be using in my next post covering modern software development with Node and VS. Already, you have a lot of features. Set a breakpoint (F9) in app.js at line one and press F5 again to run. The debugger will stop at line one. Can see all the variables in the Locals window. The Interactive Window also works. 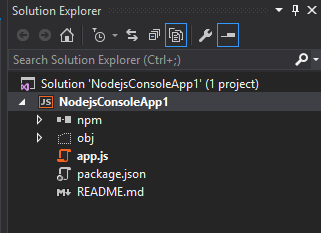 Now we’ll setup the package.json and the task runner to show Visual Studio’s support for npm scripts. A new task window opens and your program runs. You now have a full Node.js environment. My next post in this series will show how to use the package management features and write unit tests. Stay tuned!